Western North Carolina has two great tubing runs and both are near Bryson City. Both Deep Creek and the Oconaluftee River in Cherokee have crystal clear water that originates in springs bubbling up and filtering through the ferns and moss in the Great Smoky Mountains National Park. Tubing companies generally operate from Memorial Day weekend through Labor Day weekend. Just outside Bryson City, the Deep Creek ride consists of two sections: 1.) The upper “whitewater” section which flows from Indian Creek through the narrow Deep Creek gorge. This is a wild, bouncy ride that often separates the rider from the tube, especially when the water is swift after a rain. At the end of the rapids section, there’s a wide, deep swimming hole that provides a relaxing break before getting back on the tube. (2) The lower section, which is wider, easier going and more appropriate for smaller kids, ends at the parking lot. Put-in for this section is at the swimming hole just above the first bridge. Tube rental companies are located on West Deep Creek Road, near the National Park entrance.The original black truck tubes are a thing of the past. All the vendors have light-weight inflatables with seats – which can be rented for the day. From the parking lot at the Deep Creek trailhead, you carry your inner tube upstream less than a mile into the Great Smoky Mountains National Park on the Deep Creek trail. The put-in is where Indian Creek flows into Deep Creek. Just 20 minutes from Bryson City, the Oconaluftee River flows through downtown Cherokee. There you’ll find one of the purest rivers in the Mountains where you can enjoy a inner-tube ride that’s part rushing rapids, and part lazy ripples and swimming holes. The water ranges from ankle deep to chest high and flows over soft sand and flat, time-smoothed river rocks shed from the world’s oldest mountains. Tube rental companies in Cherokee transport you and your tube to a put-in spot and pick you up at the end of your ride. Nestled in the Deep Creek valley with view of the mountains and the soothing sounds of Deep Creek. 50 campsites, full hook-ups, 30 or 50 amp and primitive sites. 1 mile from the GSMNP. Tubing, camp store, trout fishing, volleyball, laundry, playground, and 2 clean bathhouses on site. 15 cabin rentals also available. Open April-November. Two bedroom, completely furnished and remodeled, quiet surroundings, washer/dryer, wrap-around porch, cable TV, view, no smoking or pets, near Deep Creek. Tube rentals. Will rent weekly, monthly, or three day minimum. Open May through November. We offer tubing service and rentals on the Oconaluftee River in Cherokee. Transportation is included. We will drop you off to enjoy the the ride, pick you up and take you back to where you started. Open Memorial Day to Labor Day 7 days a week. It’s advisable to wear a bathing suit or shorts and tee shirt and secure shoes. Watches and loose jewelry should be left behind. And eyeglasses should be secured with a head strap. Finally, because our mountain streams and rivers are cool, you should bring towels and a change of dry clothes. 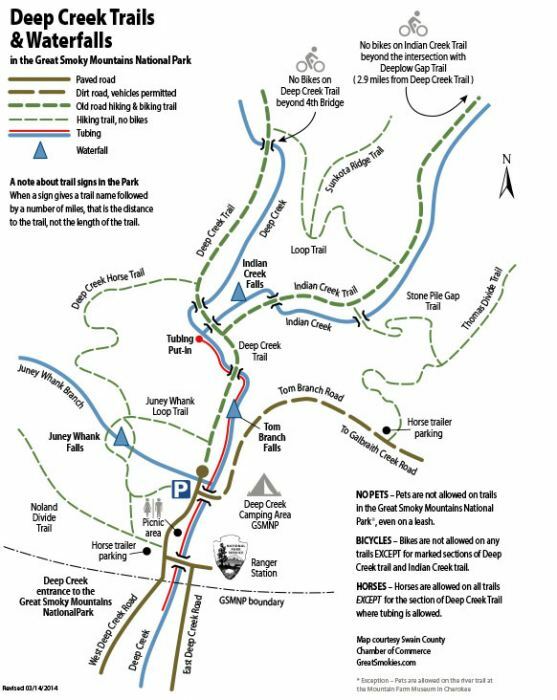 Click or tap to download a printable PDF map of Deep Creek’s trails and waterfalls.